Hybris commerce suite comes with .zip file which contains all the files required to work with Hybris. Download Hybris Zip file from SAP Market place. Unzip the zipped file using 7 zip(if you don’t have 7 zip,please download from Here) to the same folder. Delete the zipped folder of Hybris from this path. Recipe concept is available from Hybris 5.5 and later versions. Before installing Recipe, observe that we can find only bin folder inside hybris folder. This command will add the required extensions to the localextensions.xml file as per the recipe name we have provided in the command. Inside config folder, we can see that localextensions.xml got created with all the extensions specified in the given recipe. Its an Ant command used to generate the set of logically related extensions at once. we have specified module as accelerator which means we are developing B2C module. we can specify any name to the module, we have given training for the same. Template specifies whether configuration is for development or production. We have given it as develop as we are doing for development environment. b) Initialize from HAC directly. make sure Toggle all checkbox is selected. This will take considerable amount of time based on the system memory and processor as it creates new DB schema, tables and loads the configured data. 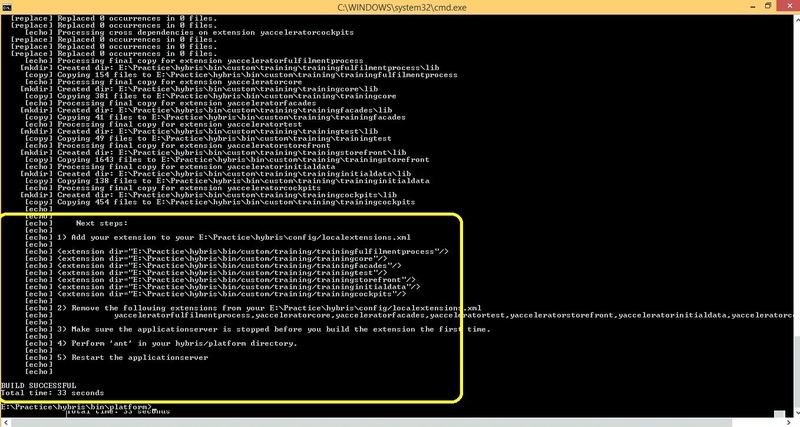 Wait till the initialization gets finished as shown in below image. All these are sample B2C sites shipped by Hybris itself. Once we are able to access these sites, we can confirm that we have installed and configured the hybris successfully in our local machine. 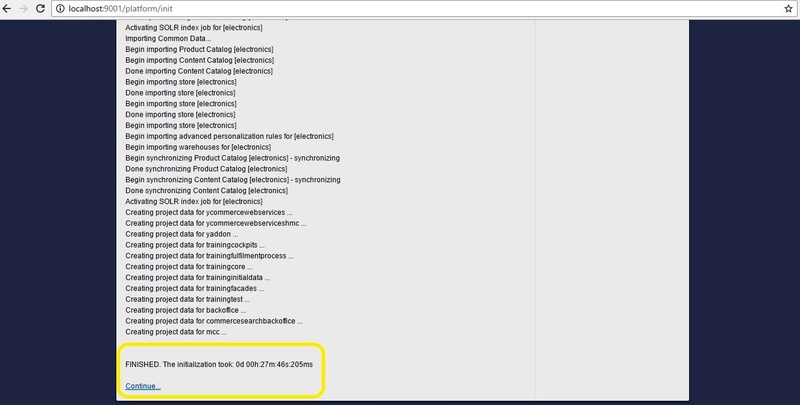 Can you please explain the difference for b2b and b2c accelerators as the installation part is almost same, and also in scenarios where to choose the opt one. Can you please tell me the basic difference and high level working differences excluding the installations for b2b and b2c accelerators. what is the best way to migrate hybris b2c 5.6 to 6.7 ? server is started and initialization is done. Able to open the electrinic site, But not able to place the order . Any more setting and commands as to be run. plse let me known . Could u pls let me know ear file location.Once we build extensions where ear is created so that Hybris server is deploying that ear. very good explanation. Could you please help me with the below error. s in source extension not found! this is not a template! Can you please write an article on OCC integration with hybris step by step soon. hello. on hybris 6.7, i cant make b2b_acc work. It gives erro. i need b2b. I am doing the trail CustomizingProductSearchPage. When i am doing ant clean all, i am getting the following error. Could you please help me. Can we start the Hybris service in debug mode using installer.bat(not hybrisserver.bat)? I am running from my mac machin getting following error. I just want to let you know that I really enjoy your website. All articles are very well written and extremely informative! Thank you so much. Keep up the good work! I am a beginner to Hybris ecommerce . I am trying to install Hybris cockpit. Can you please help me with the configuration steps. I have done configuration for Admin console and recipe. There is nothing like Hybris cockpit installation, It comes with hybris installation only. Note: I installed the hybris commerce using recipe as b2b_acc and able to access the default strorefronts. Issue is resolved as i had to remove some of the default extensions from my localextensions file which were referring to same type. could you please mention what are the default extensions that are to be removed from localextensions. Anyone was able to figure out what are the default extensions that needs to be removed? Could you write some article on props table? how it is used and how to maintain it? C:\hybris_test\wcms\hybris\bin\platform\resources\ant\modulegen.xml:55: extgen.properties in source extension not found! this is not a template! Here do i need to create installer folder in practice folder ? Though i create install.bat will not find ? can you please explain i am bit confused here. 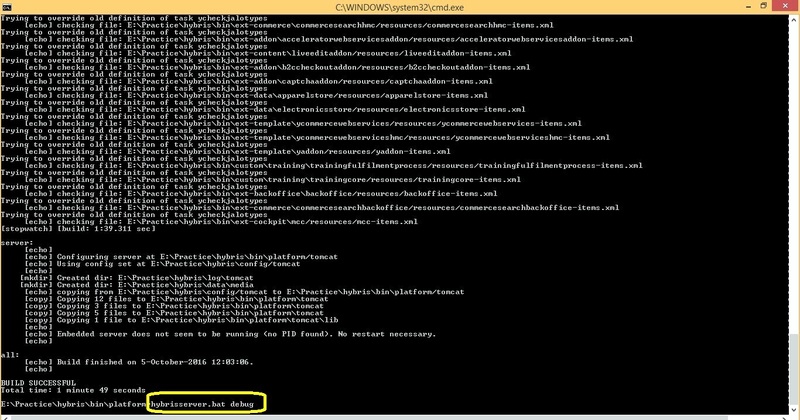 and if the command executes successfully does it creates any folders in installer folder? Same thing is explained in Step 2. You dont need to create any folder, if you unzip hybris , it will be available automatically. If we r performing initialization,first off all it create all existing data and recreates the same data..then why should we have to do initialization at the time accessing sample sites like electronics,appearals sites and etc..? Its not required, you need to do initialization only once, later you can do update. I have done only once in the above article. Why are you thinking that you need to do initialization at the time of accessing sample sites like electronics,appearals sites and etc..? Actually my doubt is why we have to do initialization…?it is just deleting and creates the same data then why should we have to doinitialization..? Only once we have to initialize to get all the schema and tables to be created and data is imported. Then onwards, if we do initalization , it will delete the old data and tables and recreate with available configuration. So only one time initialization is preferred and do update rest of the time. If you dont initialize one time also after taking hybris suite then how will you expect all the required tables and sample data available in your system ? If we want to install another recipe, what will be the steps. In the above example you have installed b2c_acc_plus. If we want to install another recipe like b2b_acc_plus, b2c_telco, what is the procedure. Please can you let us know. Note : Make sure you use the right combination of recipe based on requirement, mixing up the B2B and B2C in the same suite is not recommended by hybris. I tried mixing up B2B, B2C, B2B_ACC_PLUS, B2C_ACC_PLUS and everything got messed up. This time I just installed B2C_ACC_PLUS and it is working good. So your recommendation is , for each different recipes we install it in different servers ? Its not for each different recipe , we can have related recipes together in one server but we should not mix up irrelevant recipes like mixing B2B with B2C etc..
Any one can help me out by sharing hybris 5.7 or 5.6 through google drive or dropbox. Because i am unable to download from sap marcket palce. I followed the same steps what you mentioned and everything successfully processed. But I am getting 404 error with http://localhost:9001/ trainingstorefront/?site=electronics. Even with cuppy trail also I am getting the same error. Are you getting any error in the server console ? Is it possible to get the details of multiple tables by using flexible search query.? 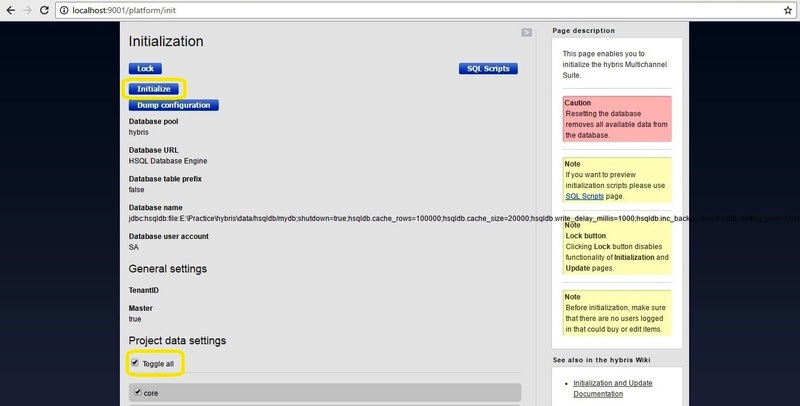 write a flexible search query to get the details of product and product features. Yes, you need to do join for that. I have installed hybris 6.0 software,but i am getting below error at the time server starting…..
but i did’t get any error at the time of receipe installation and ant clean all.. I guess your system is using the port 8983, May be Solr instance is not properly shutdown. Add below code in local.properties file. This will prevent solr starting with TomCat server. comment solrfacetsearch in the localextensions.xml. i stopped solar server.Now its working..
you are doing a Excellent job… Please provide the data hub related topics as well that will help many people.. Ya Sure Bro..Will update it , give me some time. I am not able see folders in Hybris HMC. I am able to login but am not able to see any folders in it. Can you please let me know what can be the reason for it. It happens when system is not initialized properly. And the error “Invalid column name ‘propstablename” is gone ? I am able to connect to Hybris db from sql management studio but still I am facing this issue. org.springframework.jdbc.BadSqlGrammarException: PreparedStatementCallback; bad SQL grammar [update hybris_dbydeployments set propstableName =’typesystemprops’ where propstablename NOT LIKE ‘%typesystemprops%’ AND name IN (‘ComposedType’, ‘AtomicType’, ‘CollectionType’, ‘MapType’, ‘AttributeDescriptor’, ‘EnumerationValue’) AND typesystemname=’DEFAULT’]; nested exception is com.microsoft.sqlserver.jdbc.SQLServerException: Invalid column name ‘propstablename’. I am getting same error while performing ant initialize with MS SQL 2012 as Hybris DB. Please help me. pesystemname=’DEFAULT’]; nested exception is com.microsoft.sqlserver.jdbc.SQLServerException: Invalid column name ‘propstablename’. can you plz provide the event and Listerine material with example . STATUS | wrapper | main | 2016/12/24 23:16:31.500 | Copyright (C) 1999-2016 Tanuki Software, Ltd. All Rights Reserved. INFO | jvm 1 | main | 2016/12/24 23:16:46.488 | org.springframework.jdbc.BadSqlGrammarException: PreparedStatementCallback; bad SQL grammar [update hybris_dbydeployments set propstableName =’typesystemprops’ where propstablename NOT LIKE ‘%typesystemprops%’ AND name IN (‘ComposedType’, ‘AtomicType’, ‘CollectionType’, ‘MapType’, ‘AttributeDescriptor’, ‘EnumerationValue’) AND typesystemname=’DEFAULT’]; nested exception is com.microsoft.sqlserver.jdbc.SQLServerException: Invalid column name ‘propstablename’. INFO | jvm 1 | main | 2016/12/24 23:16:46.503 | [m[32mINFO [localhost-startStop-1] [Licence] This Hybris licence is only for demo or develop usage and is valid for 30 days. Are you connected to SQL DB before starting hybris server ? Can you please let me know how can i check whether I am connected to SQL DB or not. I am using Hybris 6.2 with SQL 2012. Copyright (C) 1999-2014 Tanuki Software, Ltd. All Rights Reserved. 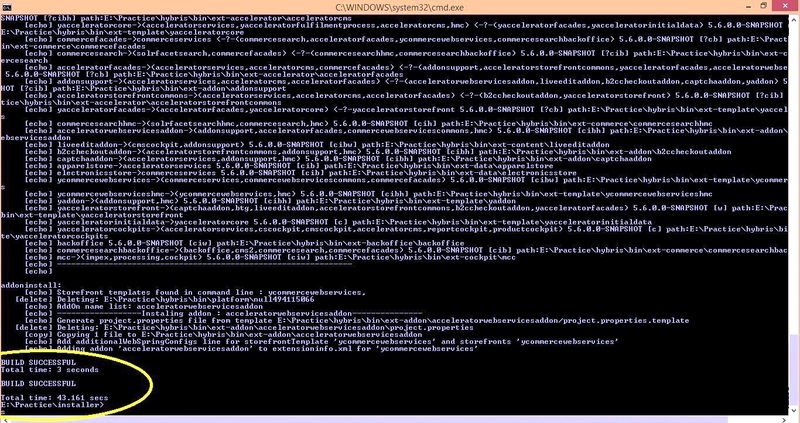 JVM exited while loading the application. There were 5 failed launches in a row, each lasting less than 300 seconds. Giving up. There may be a configuration problem: please check the logs. 1)Other application might have taken the Tomcat’s port and hence port might not be available for hybris embedded tomcat. But i am able to run java -version command . All enviornment variables are set properly . Hi , Can you open the command prompt with admin and try it. Hybris is stuck in localizing types under intialation. There is no error. It is not going ahead of localizing types in initialization phase. What is the RAM and processor configuration you are using ? As per suggested, i have changed the mysql table type as mysql.tabletype=MyISAM from innoDB.. This looks different exception, we are on track now. After installing MySql DB , have you created the database called “hybris_test” in your local ? Please provide your db config details,Let me check it. i have added local extensions , the code is not getting displayed.. I have checked your MYSQL details. 1) In db.url, you have not specified port number(default 3306),Please specify the port number in url. put these attribute in local.properties file if not yet set. Whats the impex error ? If not defined then your Hybris suite is corrupted as its OOTB bean. Where can i find the file custom_core -spring.xml? have you added them in localextensions.xml ? where it is ? I could not see it. Is it having all your custom extensions ? localhost is missing in your both the urls. it should have host name but in your url, i could not see the host name.